To put it simply, I HATED the first 50% of the book, but loved the second 50%. Which is actually a huge disappointment considering this cover has had me salivating since last year. You don't even want to know the millions of sentences I highlighted and noted throughout the first half of this novel. If you did read all those notes however, you'd get the notion that I was pissed, and you'd be right. I was sooo happy that 'Shelter You' started off right from the moment Mia ran away with her baby; it saved so much time. I figured that positive start meant the story would be everything I had hoped for, but I was wrong. If any of you know me, you know that I'm not one for sappy stories. It doesn't mean I won't be sniveling through parts of it, but it doesn't mean that I will love it. 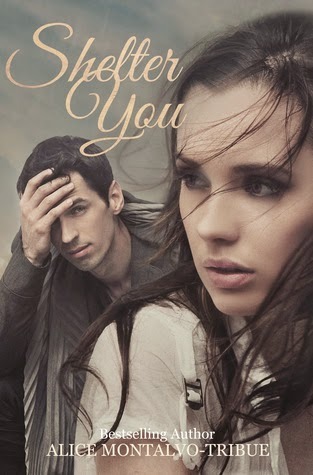 The cover led me to believe that Logan was this hot, mysterious guy who had questionable intentions (in Mia's opinon) toward her and the baby, while secretly he was just trying to help them (and of course falling in love along the way). Boy was I wrong. Logan is pretty much the exact opposite. Mia was a pretty solid, realistic character, but Logan was kind of all over the place. I feel like the author wasn't exactly sure which personality to give Logan at first, and so he was a weird mix of a billion different guys. At first he comes off as completely fake: he sees Mia and Lily, her two month old baby, and all of the sudden he's getting them emergency help and Mia and Logan have a connection, no, a spark. Like really?! He's 24 and she's 18! But besides the weird flirting thing they do which should be totally illegal, he comes off as a pretty nice person. Then, after Logan runs into Mia again at her apartment, suddenly he's being all pushy and demanding, kind of like how you'd expect Christian Grey to be (yes that Mr. Grey). Out of nowhere, out goes his nice guy persona and he's up in her doorway, demanding Mia to pack up all his things and come live with him. And what makes even less sense is that she AGREES. No new teen mother - especially one that's gone through everything Mia has - would simply go along with a complete stranger, whether or not he is a cop. As soon as Mia gets into his home, she starts commenting on the chemistry between them, and right then and there I felt like DNFing this book, and I would have to if I wasn't insanely curious about what Mia's big secret was (though I guessed correctly). Throughout this whole book, there was zero chemistry. Mia and Logan had a cute romance, sure, but chemistry? Nope. By the halfway point in the book both characters had already declared their love for each other and I was just sitting their with my mouth hanging open. Luckily, the book redeemed itself after that. Obviously, you get the suspense part and all the problems in Mia's life all come together. I feel like Mia was over-exaggerating everything, but then again she is only 18. Unfortunately, the latter half of the story didn't completely redeem the rest of it, but it did have me finish reading with a smile on my face. I wouldn't recommend 'Shelter You' to anyone since the romance felt so fake and rushed, but it was nice seeing Mia's development from the the end of the story to three years later in the epilogue. And seeing the random personalities that apparently live in Logan's body come out once in a while was really fun to see!